One stop shop for all your RC Needs! DJI Mavic 2 Fly More Kit - Lithium Battery Charger Carry Case Pro UK Hobby Store. 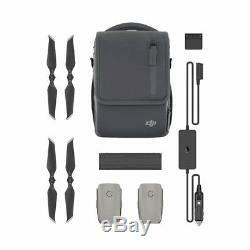 DJI Mavic 2 Fly More Kit with Lithium Battery, Charger, Carry Case and More The Mavic 2 Fly More Kit includes two Intelligent Flight Batteries, a Mavic 2 Car Charger, a Battery Charging Hub, a Battery to Power Bank Adapter, Low-Noise Propellers, and a Mavic 2 Shoulder Bag, providing you with comprehensive support during shooting. Both Intelligent Flight Batteries have a capacity of up to 59.29Wh, and each have a maximum flight time of 31 minutes. With a built-in DJI Intelligent Battery Management System, battery status is monitored and reported in real-time, allowing you to focus less on your power levels and more on having an epic flight. The Mavic 2 Car Charger allows you to charge batteries while driving, and it has a maximum output power of up to 80W and features low-voltage protection technology that ensures the charge will not prevent your car from starting normally. The Battery Charging Hub enhances efficiency by charging batteries in sequence according to their remaining power level, with more fully charged batteries receiving power first. Thanks to the Battery Charging Hubs foldable design, its easy to take it along wherever you go. You can even enjoy up to four charging ports when you use it with the Car Charger or Battery Charger. The Battery to Power Bank Adapter turns your Intelligent Flight Batteries into high-capacity power banks. Each Battery to Power Bank Adapter has two USB Type-A ports, offering 10W dual output, allowing you to fully charge a smartphone using just 20% of one battery. Two pairs of Low-Noise Propellers come in the kit as well. These next-generation propellers adopt a brand new aerodynamic design, which results in quieter flight, increased efficiency, and extended flight time. The versatile Mavic 2 Shoulder Bag is specially designed for the Mavic 2. Its capable of holding one aircraft, one remote controller, four Intelligent Flight Batteries, a smartphone, extra propellers, ND filters, cables, micro SD cards, and plenty of other accessories. Multiple Intelligent Flight Batteries for a longer flight. Turn your batteries into power banks. Low-noise propellers for quieter flight. A versatile shoulder bag to carry everything. Compatibility Mavic 2 Pro Mavic 2 Zoom In the Box Intelligent Flight Batteries x 2 Mavic 2 Car Charger x 1 Battery Charging Hub x 1 Battery to Power Bank Adapter x 1 Low-Noise Propellers x 2 Pairs Mavic 2 Shoulder Bag x 1. Wireless Madness was born out of love for RC Cars and RC Helicopters. Being long standing enthusiasts and experts in this field we bring together our know-how and experience into the hobby and toys world. Wireless Madness aims to be the UK's elite online store providing a vast range of models. Whether you're in the market for Radio Controlled Cars, RC Electric Cars, RC Nitro Cars, RC Petrol Cars, RC Planes, RC Helicopters, RC Boats, RC Bikes, RC Tanks and RC Accessories you can always find the biggest and most renown names around and in particular; HPI, Kyosho, Vaterra, Team Orion, Traxxas, Team Losi, Anderson Racing, Team Associated, HobbyZone, E-Flite, FTX as well as Carrera, Blade and Syma. Not only this, our store aims to provide 1000's of parts and spares available on the market today from all major leading brands including Spektrum, Graupner, Power HD, HiTec, Overlander to name a few. We don't stop just there, as our name suggest we love wireless technology, you can shop online or in store for slot car sets, novelty ready to run kits and even rocket launch sets. In keeping with the gadget craze we keep upto date with latest toys on the market and with our in house research team strive to be as competitive as possible. If you still don't find what you are looking for; ring our UK based office for help, advice and customer service second to none - we will do all we can to source anything radio controlled related. Credit or Debit card payments. We accept payments through most major Credit / Debit cards via our secure online ordering system using Sage Pay. Or you can pay over the telephone by calling 01772 200 888. Please note we will only post out to the card holders registered address. If you require help or assistance with your order please call our customer service helpline on the number above. We can only post out to the card holders verified address. Wireless Madness not only takes pride in its products but also sees that it is paramount all of its customers receive the best possible shopping experience. All item(s) to be unused, not installed or operated. Return of Faulty Items and Goods. Damaged or Incorrect Goods Sent. Upon fulfilling each order we ensure all item(s) are reasonably packed and are secure for transport. If you have discovered a fault and believe it is a manufacturers defect then please inform us straight away and refrain from using the product altogether. IMPORTANT : Please check the item(s) for any damage before signing as you are signing to receive the item(s) in perfect condition. If you find the item(s) to be damaged please refuse to accept the item(s). Wireless Madness cannot be held responsible for any damage discovered after the item has been signed for. Incorrectly sent item(s) or item(s) with a manufacturing fault we aim to replace as soon as possible. Wireless Madness Unit 2 Brookfield Street Preston, Lancashire, PR1 1NR. Unit 2 Brookfield Street Preston Lancashire PR1 1NR UK. Mon-Fri : 10.00am till 6.00pm Sat: 10.00am till 2.00pm Sun : Closed. The item "DJI Mavic 2 Fly More Kit Lithium Battery Charger Carry Case Pro UK Hobby Store" is in sale since Wednesday, October 17, 2018. This item is in the category "Toys & Games\Radio Control & RC Toys\RC Model Vehicle Parts & Accs\Other RC Parts & Accs". The seller is "wireless-madness" and is located in Preston. This item can be shipped to United Kingdom.